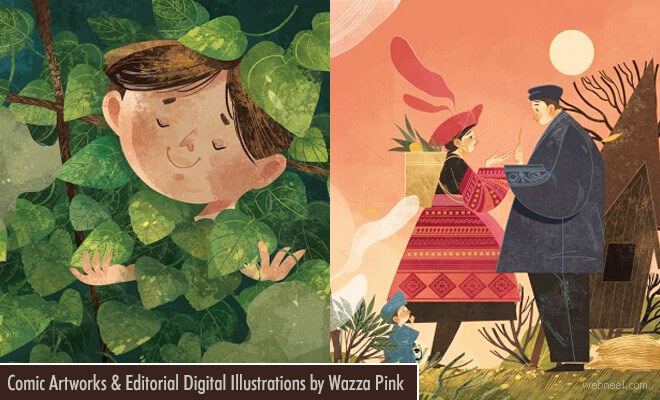 Digital Art : Wazza Pink is an editorial digital artist, illlustrator rom Hanoi, Vietnam. He has created many comic strips, calenders, short stories, poems which shows the culture in his hometown. People do beleive in fairies and monsters and he came up with an engaging story Son Tinh, who helps his village in time of their dire need. Son Tinh is also known as the mountain spirit. He is very helpful person and does every mundane tasks with a smile on his lips. One day he happened to overhear a couple conversing that they have lost their dog and he sets on a journey to find the lost dog, where he comes across monsters and rest. He has also illustrated for book covers which is exteremely cute. Happy Lunar year is a digital illustration of the calender featuring his favourite cartoon characters. Exciting Comic Art works and Editorial Digital Illustrations by Wazza Pink Neel Digital Art : Wazza Pink is an editorial digital artist, illlustrator rom Hanoi, Vietnam. He has created many comic strips, calenders, short stories, poems which shows the culture in his hometown.